Sen. Claude Carignan says he can't OK Bill C-45 and C-46 until questions about how the police force will handle impaired driving are answered by the government. Canada Day 2018 may not be as high a time as some Canadians might have hoped. On Tuesday, three Liberal cabinet ministers defended the government's cannibas legislation in a rare televised session in the Red Chamber, and the focus was on the self-imposed legalization deadline of July 1. 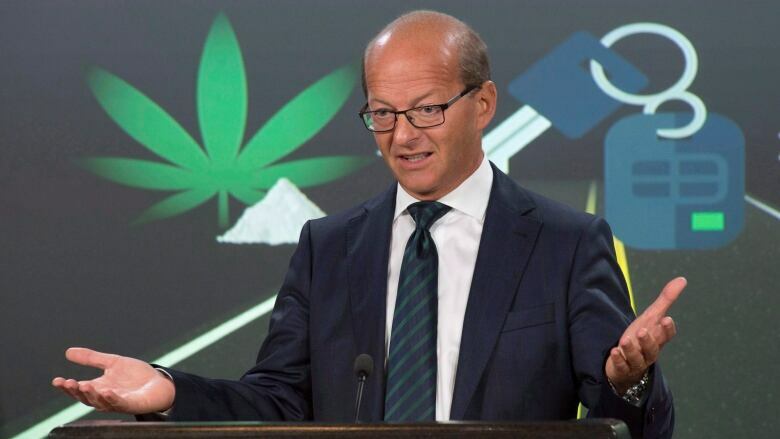 Justice Minister Jody Wilson-Raybould, Health Minister Ginette Petitpas Taylor, Public Safety Minister Ralph Goodale and Bill Blair, the parliamentary secretary tasked with seeing the cannabis bill passed, fielded questions from the senators. The July 1 deadline is being questioned, as the timeline of the bill depends on how long it takes the Senate to review and adopt Bill C-45. So far, Conservative senators have been delaying the adoption of the bill because they say some law enforcement agencies won't be ready for legal cannabis by the deadline. Claude Carignan is a Conservative senator who has been delaying the legislation because he says the necessary groundwork isn't in place. He spoke with As It Happens host Carol Off about what he wants to see in order to adopt the bill. Here is part of their conversation. Senator Carignan, a majority of Canadians support legalizing these drugs. They want reform. Why delay it? Well, first I'm not sure that the measure is if Canadians support it because that's not what I'm hearing on the ground. Secondly, the objective is not to delay it. It's to do our job, our responsibility, to study this legislation. So that's exactly what we're doing. The last time we spoke with Bill Blair he was talking about this. He was quite confident that he would be ready, the police would be ready, that the systems in place to address many of the concerns you have would be there. Why do you think that we won't be ready? That's not what we hear actually. We studied C-46. C-46, it's the impaired driving bill, and we just started our study in the legal and constitutional committee. And last week, we had the high commissioner of RCMP and he said very clearly that they will not be ready to apply this legislation during the summer. And you're talking about the drug recognition experts, is that right? But we know that people are already driving impaired. They are already under the influence of drugs and they're behind the wheel. So is it not the case that there will be methods of detection that don't exist to any great degree now. That in fact there will be better detection of those who are already out there on the road behind the wheel with drugs. Just to be clear, you're not saying that this shouldn't go through, that there shouldn't be legalized marijuana, are you? Look, I think in our job in the Senate, it's to study the legislation and not be rushed by a political agenda. And make sure that we will not create a system where the people will not be safe and secure and we always have to protect youth. So we have to make sure this is the intention of the government to do that. That the legislation, that's exactly what it's supposed to do. And actually we have seen a lot of problems with the legalization Bill C-45. We have seen also a lot of problems with the C-46 or the impaired driving bill. And we have to do our job and we will probably recommend amendments to those two bills to the government and we will see after what the government will decide to do. The issue is that right now we've had, because of the legacy of our drug laws, so many young people especially racialized young people getting criminal records while we wait for this to happen. That there have been many convictions and is that not also as important to reduce the numbers of those young people who are getting convictions? I agree with you. It's for that, that I'm in favour of the decriminalization of the cannabis. But not necessarily the legalization. That's important but I don't think that we have to go with the legalization. And we have seen people, like in Norway, the rate of consumption is very low. So I think we have to see what's happening in the other countries for best practice to reduce consumption.